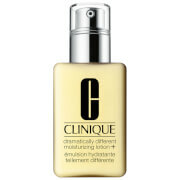 Leave skin balanced and ready for the day ahead with Oui Essential Hydrating Day Moisturiser from skinChemists. The intense moisturising formula is blended with Tiare Flower Extract, which hydrates skin whilst also soothing, repairing and purifying. Infused with Vitamin E, renowned for its anti-inflammatory and anti-oxidising properties, working to prevent skin damage and protect against external aggressors. The moisturiser is finished with Coconut Oil, offering additional hydration, helping to balance dry, itchy and sensitive skin.